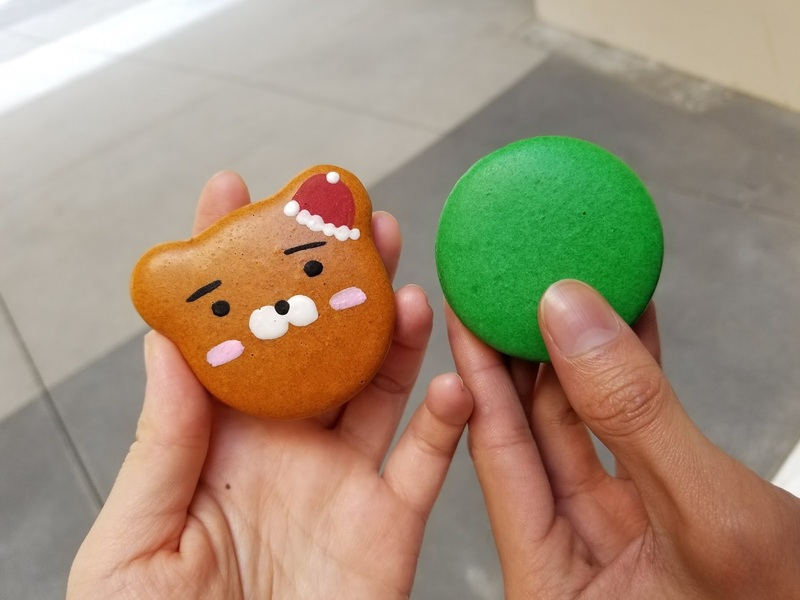 Cute Kakao Character Macarons @ Sweet Box (The Source OC Buena Park) - EAT WITH HOP! 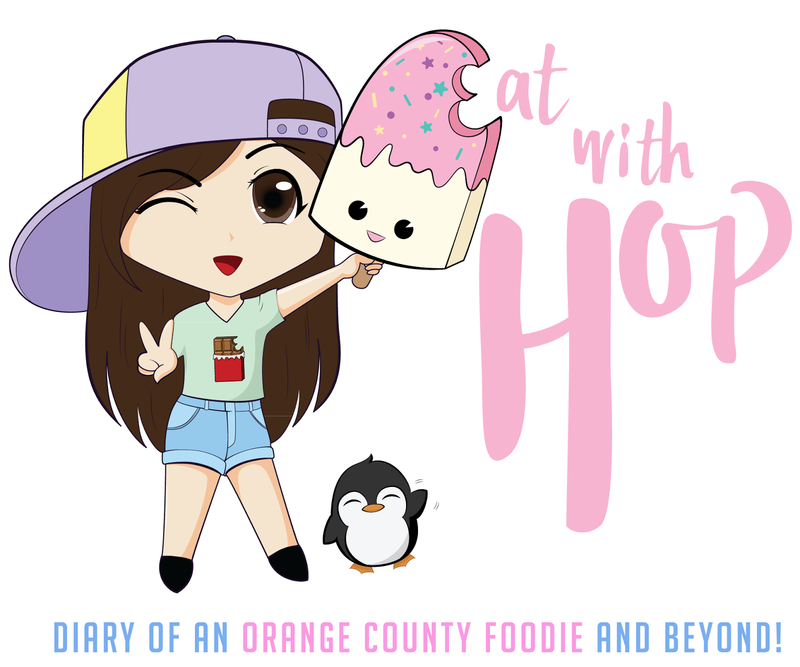 Kevin and I ate lunch at The Source OC in Buena Park a few days ago and discovered new places that recently opened! I love how this hangout spot is opening up cool spots. It's such an awesome place to chill with friends especially when they always have events on the weekend (concerts, WOD shows, dance lessons, etc.). They have a 4D movie theatre too called CGV ! 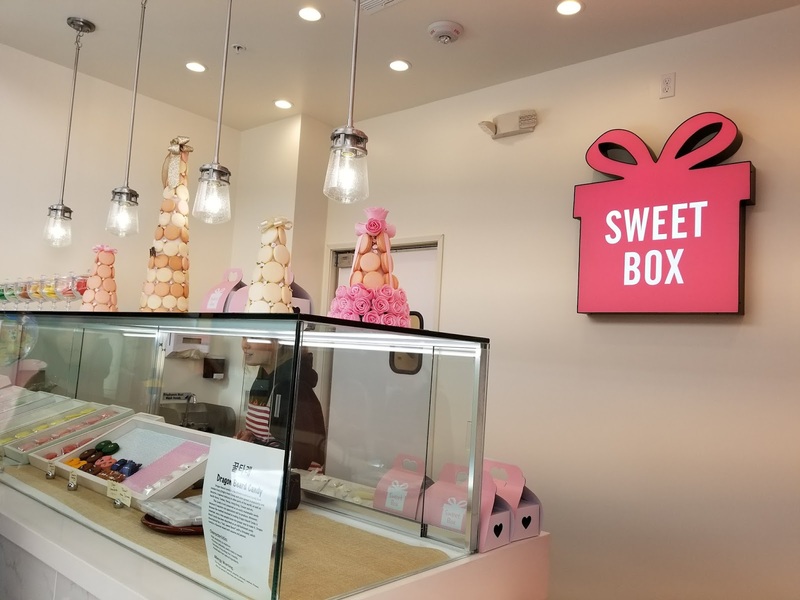 Anyway, we happened to stumble upon Sweet Box which is this cute dessert shop that specializes in MACARONS and Dragon Beard candy! I really wanna try the Dragon Beard candy next time here! I had it once in Korea but I think I waited too long to eat it and it got all hard. It's recommended to eat it asap while it's delicate and soft and melts in your mouth! It's difficult to make it and only a few people in the world can hone this craft! For our first time, we ordered the macarons. I was dying to get the character macarons because it's so cute! They have LINE CHARACTERS and KAKAO CHARACTERS! The KAKAO ones were more expensive by like a quarter though. It's a small shop located on the first floor (?!) of The Source! The character macaron that we got was CHOCOLATE FLAVORED! It is the "RYAN" character from Kakao Talk, the popular mobile messaging app in Korea! definitely chocolate-y! The taste of chocolate is thick! 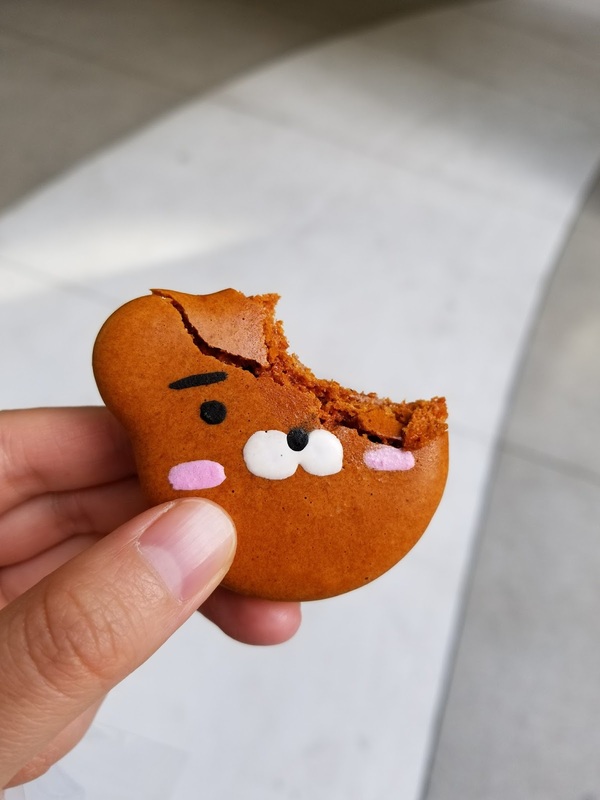 what makes this a "character" macaron is the face that is painted on. there are also ear shapes! again, overall texture has a stale crunch to it. If you are dying to get these because it's cute, go for it. 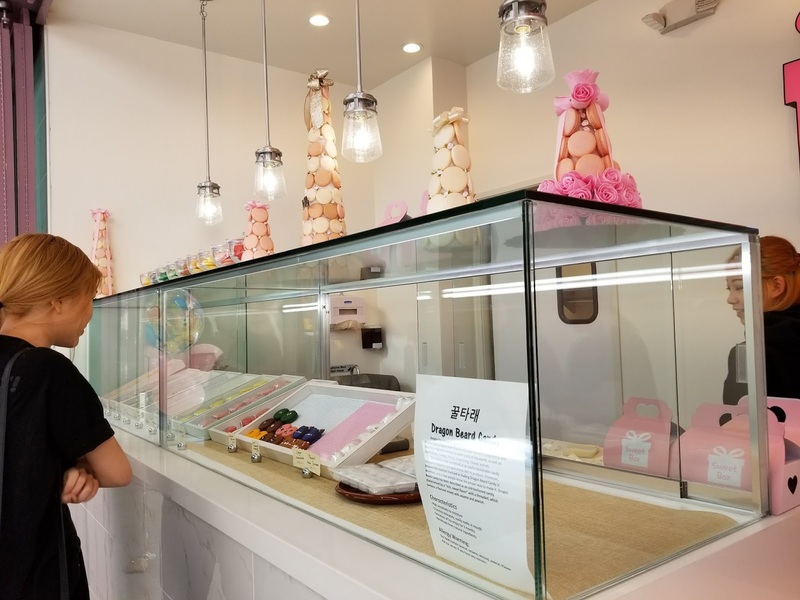 But if you want kawaii, go to Honey and Butter in Irvine or Costa Mesa. The character macarons there are on another league. Nothing beats them in my opinion. 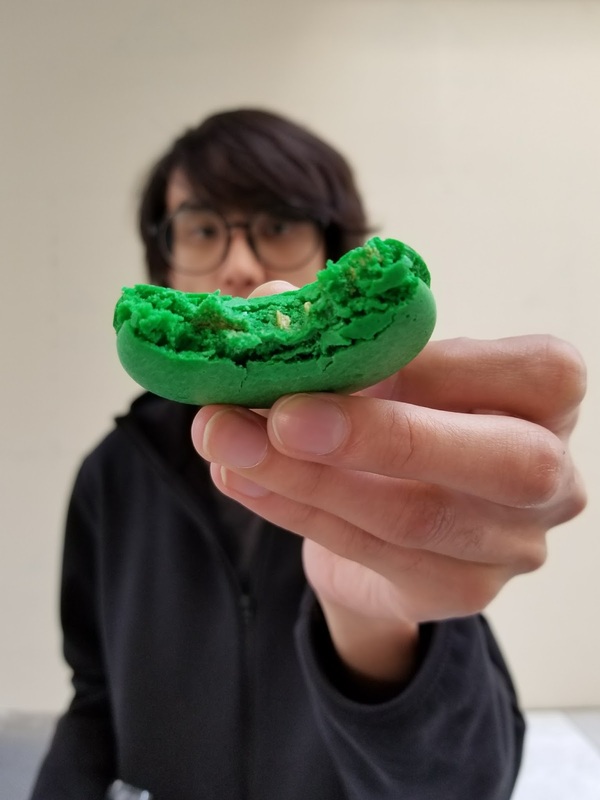 It's only $4 for a character macaron that is made with such precision and love. The character macarons aren't just painted on faces. Instead, the structure is 3-d because it's made with macaron batter. YUMMM! I do wanna go back to try the Dragon Beard Candy though (which is also available at Irvine Spectrum) next time I go to The Source!